The transcript below is from a presentation by four leading Democratic gubernatorial candidates at Advancement Project California’s Birth to Five Water Cooler conference in Sacramento. The discussion, which took place on Oct. 2, 2017, was moderated by EdSource Executive Director Louis Freedberg. Each candidate made remarks for five minutes, followed by questions. This segment features State Treasurer John Chiang, formerly state controller and a member of the State Board of Equalization. This transcript has been edited for clarity and some explanations have been added in parentheses. The full presentation is available on YouTube here. I am here on this stage because of the (American) dream. I am the oldest child of two English learners. My dad came to this country in the early 1950s — with three shirts, two pairs of pants, and less than $100 in his pocket — to learn his fifth language, English, and later to get his Ph.D. in chemical engineering. My mom went to a junior college to learn English. They had dreams to give to give their kids the best opportunities on this globe. They instilled in all their kids that it was only going to happen if we got access to a world-class education. I was one year older than my next brother, but eight years older than my sister, and 10 years older than my baby brother. I had the good fortune of witnessing my mom. I used to watch her make homemade flash cards and start drilling my little sister at age two and then my little brother with the alphabet and then with math. Click here to read transcripts from the other leading candidates. I didn’t learn until I started learning more about early childhood education that my mom waited too long to start that type of education. We now know that cognitive development, and linguistic functions generally, are very powerful when you’re seven-and-a-half months old. So I am all-in in regard to education. If we have to do anything, and if we’re going to transform California, we have to fundamentally make the investment in education. And it has to start not only with early childhood education. We have (San Francisco Supervisor) Norman Yee in San Francisco who is pushing on efforts from zero to three. We know it’s more costly, but when you understand how early you start to engage in brain development, it is going to be absolutely critical. I’m the only person that’s served in all three financial offices in the State of California (State Controller, State Treasurer, State Board of Equalization). When California was in a fiscal crisis, when somebody had to challenge Gov. Schwarzenegger during the last crisis, when he signed a budget that was $15 billion off, I was the person who stood up and said it was wrong. Why? It’s who pays the price. I was talking to some residents in San Francisco, because I said the children pay the price when the adults get the budget wrong. And then we in the education community we had $10 billion worth of budget deferrals. We had a $30 billion cash deficit. Today, as the treasurer, I’m going to make sure that we invest in the educational programs to maximize and optimize the returns so that we can go all-in on early childhood education and, frankly, all of education. We have too many kids today going into the work force while working off debt. So my platform of upward economic mobility is not only education, but it’s also housing, it’s job creation, it’s all the things that everybody wants passionately for an improved quality of life and the dream that we call California. Freedberg: To what extent should the state make universal preschool available to all kids? Chiang: I fully support universal preschool. We also need to make sure that early childhood educators have advanced degrees. We want people who can provide high-quality instruction. And we have to provide support, whether it’s in the classroom or within community settings, to make sure that people know how to facilitate the best possible practices. We have to make sure that all the community participants understand what really creates transformative change in a child’s life. We then we have to understand that we live in different types of economic circumstances. We have to make sure that we invest in particular communities, because you can’t always just refer to the that old Harvard study of taking a child from a lower-income community and sticking them in Palo Alto or Beverly Hills to change their outcomes. We need to invest in every single community in the state of California, to make sure that people know how to get the skill sets, the talent, the abilities to change every single child’s life so that they can reach their fullest potential. Freedberg: Gov. Brown said that California can’t afford to pay for universal preschool. So can California afford universal preschool? And where would the funds come from? Chiang: I think it’s crystal clear. We can’t afford not to have universal preschool in the state of California. We have a globally competitive economy. It’s becoming incredibly dynamic. So it’s not only early childhood education. We have to figure out throughout the spectrum how we provide education. Today, we have 50-, 60-year-olds who are being displaced by technology. We need to make sure that they get a skillset that they have an opportunity for gainful employment so that they can have a dignity in their life, that they don’t have to face the extraordinary struggle that so many people face. We have to make some tough choices. But unlike some of the others, I created additional options for the state. When I was the controller, I sued President Bush’s administration, MMS [Minerals Management Service], to retain our mineral rights. When I was the controller, I was the most successful auditor in California history. I did $9.5 billion of audit findings. Kathleen Connell (state treasurer from 1995 to 2003) did $2.5 billion of audit findings. The issue is how do we spend our money more efficiently and effectively. As the state treasurer, I’ve worked very aggressively to refinance when we had better economic conditions, and through better financial management, enhanced California’s credit status, so for the first two and three-quarters years as the state treasurer, over the lifetime of those bonds, we will have saved the taxpayers of California $5.9 billion. So $100 million here, $500 million here adds up, and we can find the funding we need for early childhood education. Freedberg: Should we be expanding Transitional Kindergarten? Or should the emphasis be on preschool? Chiang: I want good education that’s basically all day long. We can’t have the system we have today where you have kids going in for half a day. That creates lack of access, especially for low-income folks, who have to take public transportation, who can’t leave (their jobs) in the middle of the day. In addition to education, I want to tie in services especially for low-income folks, so it’s not only education but also housing services, healthcare services, social services, tied in with the county and the private sector. I am open to what that looks like. I just want to make sure that we have all-day education for the kids. Freedberg: Do you think that we are on the right track with the Local Control Funding Formula? And to what extent do you think we should stay the course and, if you were governor, that there would be continuity? Or where do you see we need to move in other directions? Chiang: I support LCFF. But I want to see what is happening in the classroom. We have to make sure that the teachers are well-supported, they’re well-led, they’re well-trained, so that they can make sure that we get student academic achievement at the highest levels. Part of what I like about LCFF are the eight priority areas. But what is more important is how it’s applied — and we make sure that we build good school-site leadership. What I don’t want to happen is a misallocation of resources, especially to those (schools) that don’t have the same accountability and transparency. You have to have the same conflict-of-interest, accountability, transparency standards, so that schools can be responsive. We don’t want kids with special needs not having that particular access. And, unfortunately, that’s what’s happening within the current system. Freedberg: So you would support the basic framework, where we have concentration grants going to these high-need students? And the supplemental grants? Chiang: Yes. When you have kids whose second language is English, when you have foster-care kids, where you have a large percentage of kids who qualify for free or reduced price lunch — where there is that great need, I want to make sure that we have the appropriate investment. But I don’t want that to be the cap. The state has to do a much more effective job. We are so under-invested (in our schools). I want to put more money (into education). And then let’s make sure that we measure the results so we can have high (academic) attainment. Freedberg: California lags so far behind most other states in terms of how much we spend per capita on kids. You’re in charge of California’s funding. What do you see as the potential to really increase funding for kids and for schools? Chiang: Yes. There are a whole host of different things that we can do. Part of that is making sure that we prioritize education, that it’s always at the front of the line. That’s why I took tough action at the controller’s office to make sure that money was available for education, even though others paid the price. But part of this means asking what can we do better in how we use our money? And how do we use it more efficiently? I was on the commercials for Proposition 30. They wanted somebody to validate that we had this (oversight) in place. When the media asked (State Controller) Betty Yee how we will determine whether those monies are actually used for education, I created the Track Prop 30 website because I wanted to validate for the voters that we would use the additional tax revenues to pay for education. You can go on Betty’s website and check how those dollars are used. Freedberg: Could you see going back to the voters to ask for more? Chiang: Yes. There are a lot of things we can do in regards to parcel tax and other things to make sure that we have additional monies for the state. There are other iterations of what we might do in the future, from cap and trade or carbon taxes that could bring more money for the state. Freedberg: Do you think the state needs to be more prescriptive than it is now in telling schools what to do? Or do you think we have the balance right? Chiang: Well, the state has to establish the standards we want. But I’d like to give the local school districts and their leadership the flexibility because they understand what’s happening in their communities. Our communities are incredibly different. But I want them to understand the governor’s office is going to be really aggressive in regards to being a positive partner in reaching out to the business sector and philanthropic organizations, to go after social-impact grants and bonds so that we can establish additional funding partnerships and implement best practices in local districts so that children can thrive and succeed. Freedberg: There have been concerns that we’re not perhaps seeing the results that people would like, or not fast enough, and so the state needs to hold the school districts more accountable than they are currently under this multiple-measure accountability system. Where do you come down on that issue? Chiang: I’m not going to accept failing schools as the governor. I was a very good student, but there were subjects I struggled with. I was fortunate to have great individual teachers. When I hit a particular concept that I struggled with, like in geometry, my teacher would intervene right there. So I want to understand where children are struggling. When you see that schools aren’t performing as well, I want to have conversations with the school-site leadership, elected officials, school-board members, the administrators, the PTA, and to ask what we need to do to change direction, or improve and accelerate progress. Freedberg: Where do you come down on charter schools? Do you think there should be some limits placed on them? Or do you think there should be unlimited expansion? Chiang: You can’t have unlimited expansion. You’re going to unwind the whole financing mechanism for the State of California. You’re going to have all these incredible obligations that could potentially put the state in harm’s way. We support the charter schools because they were created for innovation. So you have people there in some incredibly high-performing charter schools that you want to support. They’re engaged in certain types of activities that are productive. But I don’t want separate standards. They have to be subject to the same conflict-of-interest standards (as regular schools). I’m opposed to charter schools for profit. Because I don’t believe you ought to be using public dollars so that you can line somebody’s pocketbook. They have to be held accountable, and they have to be transparent. To use public dollars, you have to have the public trust, and to have public trust, you have to be straightforward and forthcoming so people can understand what you’re actually doing. And they have to be more inclusive. I’m not saying they’re all exclusive. But I have a friend whose husband is for charter schools, but she is vehemently opposed to charter schools. She has a child with special needs, and when she approached various charter schools, they dissuaded her from enrolling her child there, because they said “We don’t have programs to assist your daughter.” That’s not acceptable. They ought to be able to provide assistance and great programs for every single child. Freedberg: The Smarter Balanced test scores came out this fall, and the average scores were flat compare to the previous year. How did you react to those test scores? And do you agree with the notion that we shouldn’t be so focused on test scores, which really is kind of a national obsession? Chiang: Well, test scores are one measure. We know that oftentimes test scores don’t fully reflect everything that’s been picked up by the child. At the end of the day, it’s the knowledge (they acquire that’s important). But also we have to measure the circumstances that we’re creating. So, what do we learn from that test score? What other additional knowledge can we get? Are they in communities of poverty? Are they in communities where there’s economic distress? Are they one of the three schools in Fresno Unified School District, where over 50 percent of the kids come from homeless conditions? I’m never satisfied. We have to make sure that we’re always on an upward trajectory. And so whether it’s a real plateau (in test scores), let’s learn from that, make sure that we do more, and we get everybody involved. Erwin Morton, Sixth District PTA: Prop 98 was voted in to provide a floor for education funding. And, like most floors, it quickly became a ceiling. How do we fix that? Chiang: I fully support Prop 98. But it has created that issue where it has become the ceiling. We’re just going to have to identify priorities, and education for me is a priority. We know that you can postpone Prop 98 during difficult economic times, but we have to come up with some type of trajectory as to what type of financing, and what type of financing stream needed to address how we’re going to finance a world-class education for all the kids in this state. So that will be part of the complex conversation that we will have, not just for K-12, but, frankly, for the CSU system and the UC system. Debbie Silverman from First 5 California: What are your thoughts on improving compensation for that early childhood workforce? Chiang: It’s not just early childhood education, but it’s across the board. We know early childhood educators are especially underpaid. But we know educators are particularly underpaid throughout the education system. You look at the research, especially in regards to early-childhood education, and the advanced knowledge that’s required. Other jurisdictions are looking at requiring instructors to have a master’s degree. We ought to pay people the appropriate salary so that they can get the appropriate education so that they can have a decent standard of living — so they can live in the state of California. One of the things that I’ve also been pushing for is financing more workforce housing, so you can have teachers who are able to teach in the communities that they reside in? View the full presentation on YouTube. 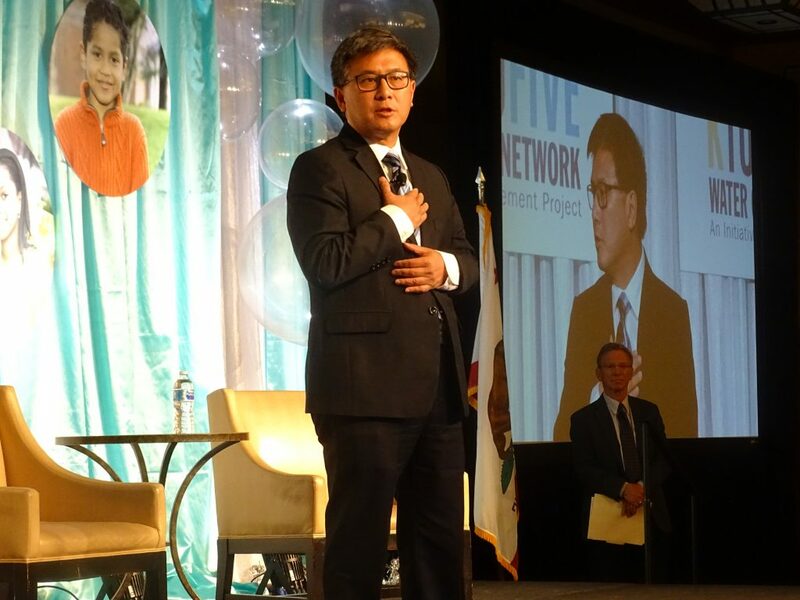 See John Chiang’s website for more about his views on education.